Our universe is a vast and magnificent place. The universe is infinite, and always expanding. It incorporates billions of stars, planets, galaxies, the contents of intergalactic space, the smallest subatomic particles, and all matter and energy. The Milky Way is just one galaxy in the vast universe. Other than being just another galaxy in the universe, the Milky Way is important for a much more important reason. It contains our Solar System, which is just one between billions others. The name Milky Way comes from the fact that when viewed from Earth, the galaxy looks like a dim glowing band arching across the night sky. The name is actually a translation of the Latin ‘via lactea’, from the Greek galaxías kýklos, meaning “milky circle”. 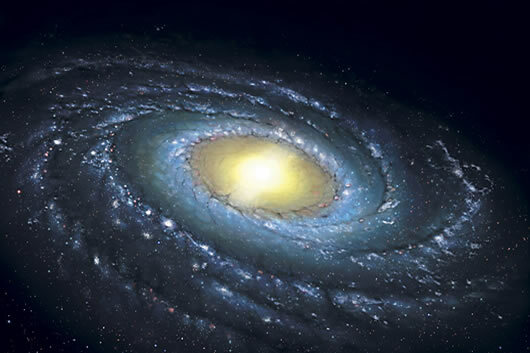 The Milky Way is actually a spiral galaxy with its arms spiraling outward. However from Earth it looks like a band because its disk-shaped structure is viewed from within.